“Kanata” is what the French explorer, Jacques Cartier, heard the indigenous people call their country when he first visited the new world. It was actually a misunderstanding; the natives were referring to what they called their village. At any rate, the name stuck. Canada is what she has been called ever since. Canada has been independent since 1867 but maintains close ties with the British monarchy. In fact, Queen Elizabeth II is Canada’s head of state and appears prominently on their currency. Canada had been passed back and forth between the British and French monarchs for centuries, which is why both French and English are listed as the official languages. Although English is considered to be the main language, French is spoken almost exclusively in Quebec and New Brunswick. The First Nations, Inuit’s and Métis, Canada’s native tribes, make up only a small percentage of the population. They are the aboriginal people who played a critical part in the development of the European colonies in Canada. The citizens of Canada came mostly from England and France, however, over the centuries, people from many other countries around the world immigrated there. Canada’s immigration policy has historically been very welcoming. The climate is cold there and the Yukon holds the distinction for the coldest temperature on record; -63 degrees Celsius. Some areas have snow ten months out of the year. 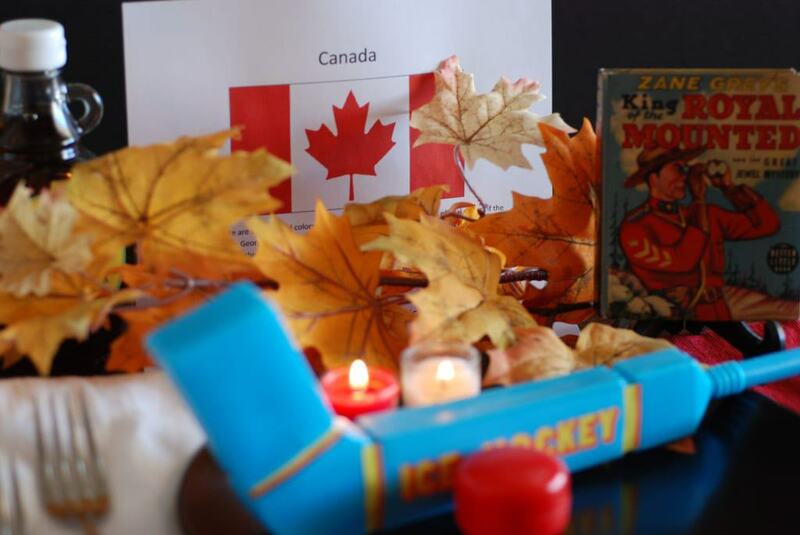 Canada takes full advantage of this climate with ice hockey proudly honored as the national sport. Canada actually won the highest number of gold medals ever won at a Winter Olympics, in Vancouver of 2010. In their closing ceremony, they carried their national flag with dignity, displaying a single maple leaf; a very important national symbol. Speaking of the maple leaf, Canada produces 80 percent of the world’s maple syrup. In fact in Quebec, they actually have a maple syrup strategic reserve. This reserve is kept by the Federation of Maple Syrup Producers, which was founded in 1966 to regulate the business dealings between buyers and farmers of maple syrup. In 2012 there was “The Great Maple Syrup Heist,” where 23 criminals stole 60 percent of the reserve. The perpetrators were caught and prosecuted and are now serving time (instead of pancakes,) thanks to the help of the Royal Canadian Mounted Police. The Mounties are another iconic symbol of Canada. Our beloved western author Zane Grey may have had a hand in the Mounties popularity as he allowed his name to be used on a whole series of Big Little books and Comic books and even a few movies about them. Canada has a short growing season and most of their agriculture is exported. They have a lot of cattle and dairy production, however, no artificial hormones are allowed to increase milk production. No milk, cheese or yogurt produced in Canada contains these hormones, which are considered safe and legal in the United States and other countries. The cattle ranchers in Canada just make sure their cows are healthy and well-nourished in order to maximize milk production. Cattle are an important part of Canada’s tradition. Have you heard of “Cowtown”? That is what Canadians lovingly call Calgary, which is where the most famous and largest rodeo festival in the world is held each July. Known as “Stampede”, this festival lasts ten days and brings in over a million people each year. It is thought that such a good time is had, that it explains the surge of newborns in April the following year. Revelry abounds, with square dancing, cow roping, music, chuck wagon racing and of course, a lot of Canadian beer drinking. A word of caution, don’t ever get in a beer drinking contest with a Canadian. Just don’t. As we look into the cuisine of this nation, a former Prime Minister named Joe Clark probably said it best. “Canada has a cuisine of cuisines. Not a stew pot, but a smorgasbord.” Choosing a meal for this country was not easy; there are so many choices. 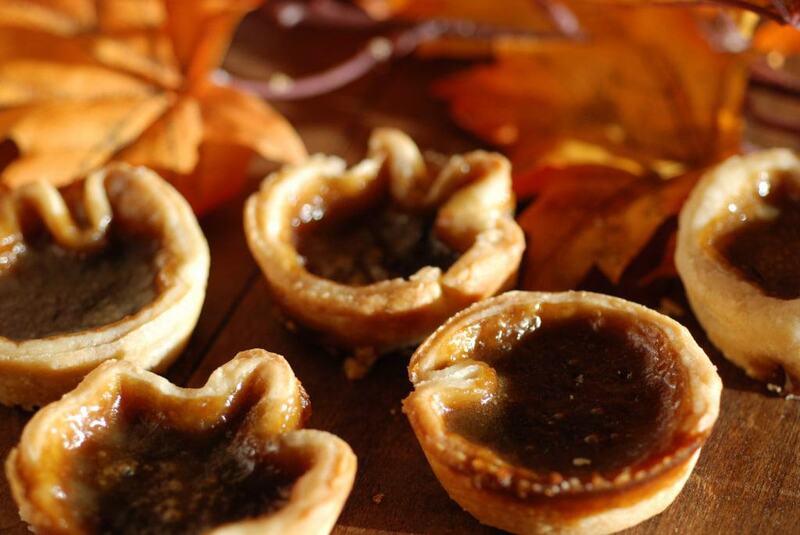 I wanted to choose dishes that would impart a bit of Canada with each serving. It is cold there, so they have healthy appetites and eating three hearty meals a day is common. Obviously with all that coastline, fish and shellfish are a culinary mainstay. They even serve a” McLobster” sandwich at McDonalds there. With all their natural wilderness, game meat is also abundant. Many consider a somewhat unusual dish they call “Poutine”, as the national dish. 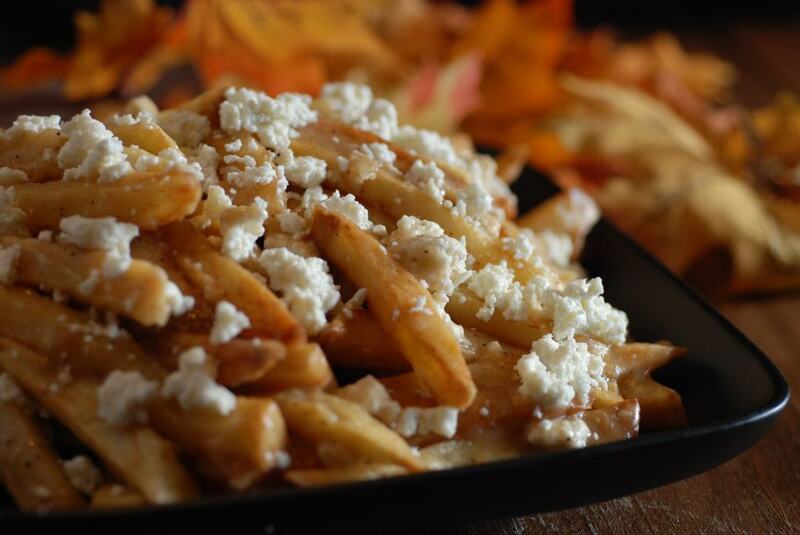 It is made with french fries and topped with gravy and cheese curds. Another interesting food fact is that Canadians love KRAFT macaroni and cheese. They eat 55% more in Canada, than in the United States. Canadians are known to be friendly, have a great sense of humor and love to drink beer! We decorated our table with what else, maple leaves! It seemed like the perfect thing to do as autumn is now upon us here. 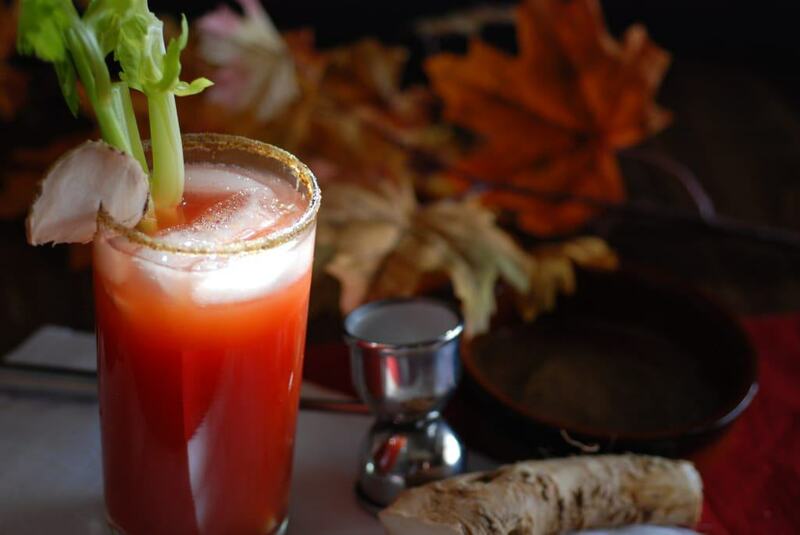 We began the meal with a popular drink called a Caesar, and a French toast “A votre santre” (to your health) The drink is very similar to a Bloody Mary, but made with a combination of tomato and clam juice. They season the rim with celery salt and drink it through a straw. 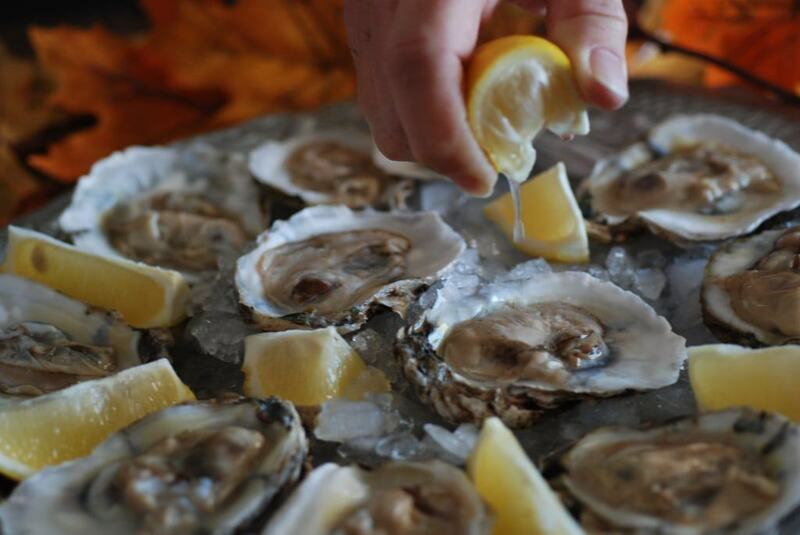 This went perfectly with our appetizer of oysters on the half shell, which are available in Canada year round. 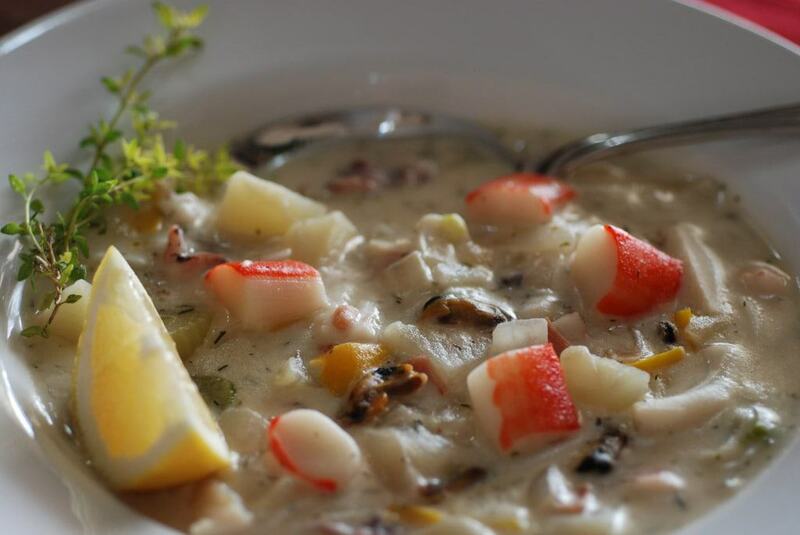 Next we had a soup course; the delicious, hearty and creamy seafood chowder. This soup would be wonderful anytime, for lunch on its own and perfect for a cold wintery day. For the main course we had an amazing Canadian Chinook, wild caught salmon, marinated in some of their famous maple syrup. (You need to buy the real thing and then you will know why there was a heist.) 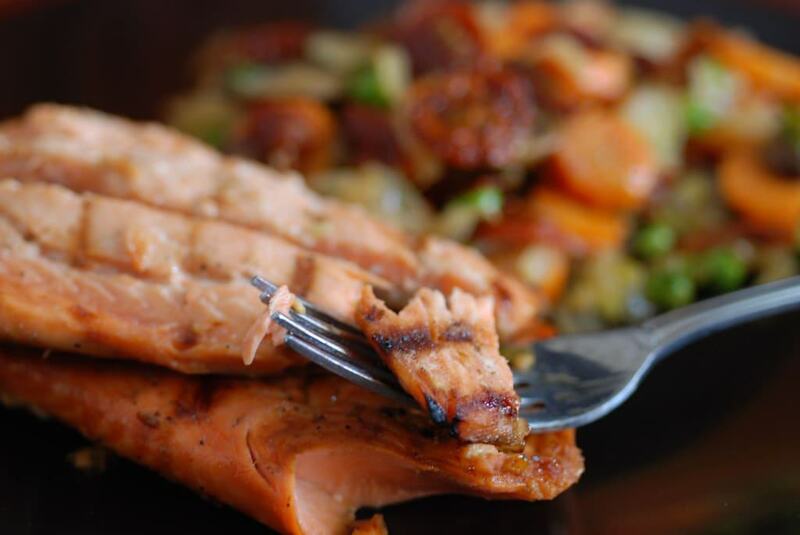 It was grilled perfectly and the combination of flavors with the mixed vegetables was awesome, both sweet and savory. 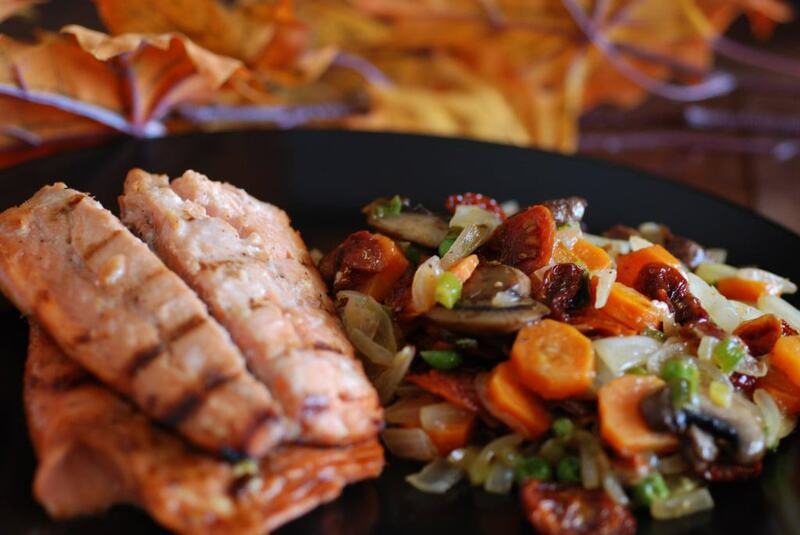 Sautéed onions with mushrooms, carrots, peas and sun-dried tomatoes with a hint of citrus made for a lovely side dish. Of course we had to have their famous dish, Poutine. This was also delicious and all I could think of was there must be something to living in a cold climate that allows a person to eat this kind of rich, fried food. I suppose you just burn more calories trying to stay warm. I will have to keep that in mind this winter when I set my thermostat! For dessert we had their famous butter tarts; little tastes of sweet goodness, sort of like a mini pecan pie without the pecans. We talked about our beloved author Zane Grey as he was also a world class fisherman. He held eleven world fishing titles and caught his first record a giant Blue Fin Tuna weighing 758 lbs on a knuckle busting reel of the day off the coast of Nova Scotia in 1924. As we say goodbye to this giant country called Canada, it seems there is a lot the world can learn from the way these people live and get along with each other. Perhaps it is the high level of education their people achieve; they have an astounding literacy rate of 99% and 51% complete tertiary education, which is the second highest rate in the world. They are happy and the average life expectancy, at 82.5 years, is one of the highest in the world, perhaps due in part to their social healthcare system. They gained their independence peacefully, through dialog and negotiations, instead of war. The former president of the United States, Bill Clinton, had this to say about Canada. “In a world darkened by ethnic conflicts that tear nations apart, Canada stands as a model of how people of different cultures can live and work together in peace, prosperity and mutual respect. The Anglo-American culture region is almost unimaginably diverse. Fascinating examples abound. From personal experience, I cite the following anecdotal evidence of oblique divergence within this region’s cultural behavior. Once, I attended a private dinner at a home during Calgary Stampede. Warm and lovely, it was gracious, eh? I was surprised, though, the hosts never provided dinner napkins. What was that about? It wasn’t about the hosts’ careless oversight, I decided over plentiful, savory courses and attentive hours enjoyed at the table. What I observed was my hosts often calling their youthful, high-spirited, albino, long-haired, cross-eyed dachshund, Eros, to the table during the dinner. He scurried playfully on wee skippy legs between them beneath the table as they petted and stroked him. Before long, I caught on and joined in. “Eros, come here, pup,” I called, rubbing his glistening coat vigorously with hands wet and slick with crudities, Salted Fried Marrowfat Green Peas, deviled herring-eggs and ham-and-sweet-pickle relish finger sandwiches. “Eros, here boy!” I inveigled, raking his lustrous coat with fingers thinly filmed with Arugula-stuffed Leg of Ontario-slaughter Lamb with Roasted Spring Vegetables and Alberta Beaverlodge Slicer Tomato-fennel Vinaigrette. “Eros, Eros!…” I sing-songed, lifting him to nuzzle his delirious slick muzzle against my face, beard and high, salty forehead. “Help me finish my Newfoundland Figgy Duff Steamed Pudding?” I’ve never seen it, or heard of the behavior in another place in all my travels, but here within the closely-weaved fabric of the Anglo-American culture region, I found our nearby friends in the Canadian North Country use small, wieldy dogs for service as good-quality and attractive hem-stitched dinner napkins.